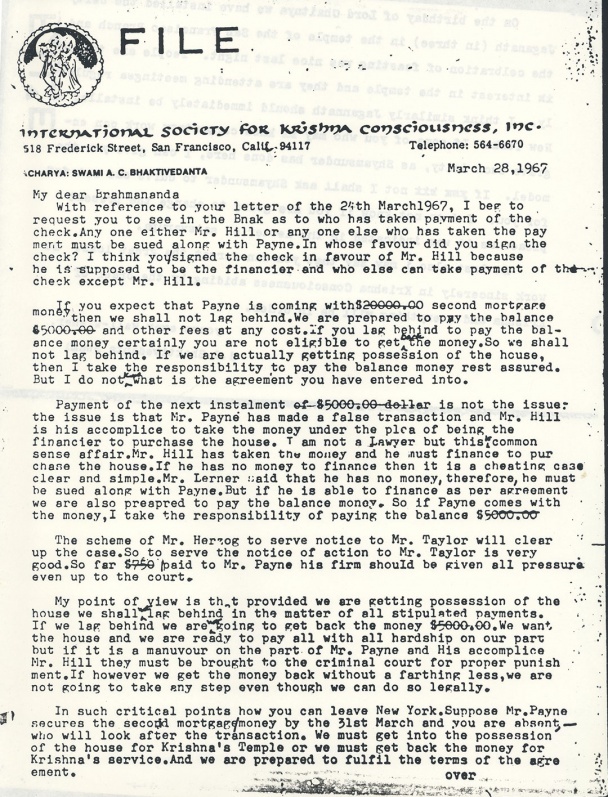 INTERNATIONAL SOCIETY FOR KRISHNA CONSCIOUSNESS, INC.
With reference to your letter of the 24th March 1967, I beg to request you to see in the Bank as to who has taken payment of the check. Any one either Mr. Hill or any one else who has taken the payment must be sued along with Payne. In whose favour did you sign the check? I think you signed the check in favour of Mr. Hill because he is supposed to be the financier and who else can take payment of the check except Mr. Hill. If you expect that Payne is coming with $20000.00 second mortgage money then we shall not lag behind. We are prepared to pay the balance $5000.00 and other fees at any cost. If you lag behind to pay the balance money certainly you are not eligible to get back [handwritten] the money. So we shall not lag behind. If we are actually getting possession of the house, then I take the responsibility to pay the balance money rest assured. But I do not know [handwritten] what is the agreement you have entered into. Payment of the next installment of $5000.00 dollar is not the issue: the issue is that Mr. Payne has made a false transaction and Mr. Hill is his accomplice to take the money under the plea of being the financier to purchase the house. I am not a Lawyer but this is common sense affair. Mr. Hill has taken the money and he must finance to purchase the house. If he has no money to finance then it is a cheating case clear and simple. Mr. Lerner said that he has no money, therefore, he must be sued along with Payne. But if he is able to finance as per agreement we are also prepared to pay the balance money. So if Payne comes with the money, I take the responsibility of paying the balance $5000.00. The scheme of Mr. Herzog to serve notice to Mr. Taylor will clear up the case. So to serve the notice of action to Mr. Taylor is very good. So far $750 paid to Mr. Payne his firm should be given all pressure even up to the court. My point of view is that provided we are getting possession of the house we shall not [handwritten] lag behind in the matter of all stipulated payments. If we lag behind we are not [handwritten] going to get back the money $5000.00. We want the house and we are ready to pay all with all hardship on our part but if it is a manouver on the part of Mr. Payne and His accomplice Mr. Hill they must be brought to the criminal court for proper punishment. If however we get the money back without a farthing less, we are not going to take any step even though we can do so legally. In such critical points how you can leave New York. Suppose Mr. Payne secures the second mortgage money by the 31st March and you are absent who will look after the transaction. We must get into the possession of the house for Krishna's Temple or we must get back the money for Krishna's service. And we are prepared to fulfil the terms of the agreement. On the birthday of Lord Chaitanya we have installed the deity Jagannath (in three) in the temple of the San Francisco Branch and the celebration of feasting was nice last night. People are taking interest in the temple and they are attending meetings regularly. I think similarly Jagannath should immediately be installed in New York. If some of you who may know carpentary work can engrave such deity, as Shyamsundar has done here, I can give you the model. If not I shall ask Shyamsundara to carve one set for you. I do not know if you are going to change the present place as it was indicated in the letter of Satsvarupa. At last also I may say that you can forget the great loss. Do work sincerely in Krishna Consciousness abiding by the order of Krishna and everything will be in order.